The medical pendants are the systems designed to provide appropriate positioning and arrangement of equipment, terminal units, medical gas, specialty, electrical services and other surgical assistance materials used during surgical or medical process. A medical pendant system is installed on the hospital ceiling with a strong body system composed of stainless steel extensions and supporting rods. Such systems are compact with customizable configurations in order to fulfill exact requirements of hospital or any other healthcare center. Doctors and medical professionals worldwide have acknowledged its potential and are adopting them in procedures like endoscopy, anesthesia, ICU procedures etc. Medical pendants have numerous arms which can be used to lodge all electrical services, medical gas, data communication services and simplifying Equipment management. They are acclaimed to be a very useful entity for all medical enterprises because of their functionality to make medical tasks easier, and ensure safety while placing monitoring equipment along with extending space in the operation theatre for operations and critical care areas to improve mobility around the patient bed thereby enabling healthcare staff to deliver effective patient care. They are basically used by specialists for holding various medical devices during surgery and different medical procedures. Globally improving medical practices and moving the focus towards ensuring patient safety are among the various key trends and is expected to drive the demand and considerable share for medical pendant during the period of study. Geographically North America dominated global medical pendant market and is poised to be the leader in terms of revenue generation driven by best in the class healthcare infrastructure, advanced facilities, best healthcare practices coupled with strict guidelines from the regulating authorities. North America was followed by Europe and Asia-Pacific as second and third largest market for medical pendant market. Asia Pacific is projected to have fastest growth in adopting medical pendant system, owing to rapidly increasing healthcare infrastructure, increased spending, government initiatives and growing focus on better healthcare practices due to growing medical tourism industry in developing nations such as China, and India in this region. Prior mentioned trends will add market value and promote its worth, directing its establishment as a more prominent asset. Forecast of consumption in such large markets will definitely increase the market size for medical pendant system. This report identifies the global medical pendant market size via acute analysis for the year 2014-2016, and forecast of the same for year 2021. 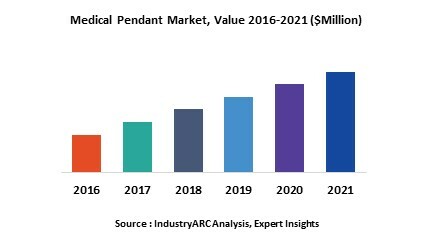 It also highlights the market drivers, restraints, growth indicators, challenges, prices modulations and other key aspects with respect to global medical pendant market and provides an outlook for the same.